Palau started a collaboration with Spanish designer Mario Ruiz in 2010.This resulted in the stylish armchair BLUE in 2012. Armchair BLUE has a removable cushion. 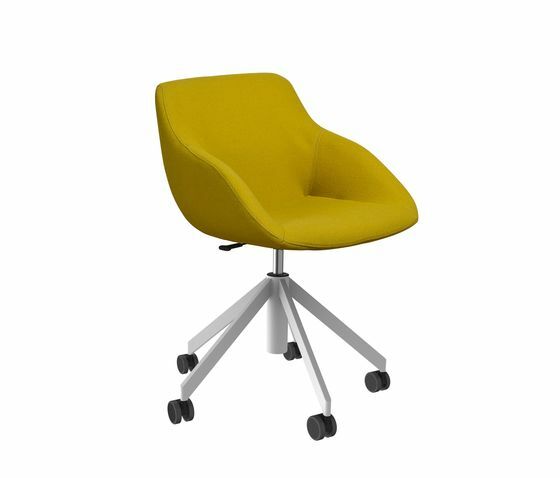 The chair has highly ergonomic seating comfort without losing its compact design. With its clear simple silhouette BLUE can make a statement in many interiors. Blue is also available with a headrest, Blue Extended. An elegant additive resulting in extra comfort. Like chair Blue the Blue extended is obtainable with a swivel undercarriage in the colours white, black, blue and Alu-colour. Other RAL-colours on request. Blue Extended is available in all current fabrics. The legs of BLUE are available in stainless steel and different RAL colours. Blue is also available with a stainless steel sled base. The Blue conference chair has several options regarding the undercarriage: a 4-legged steel undercarriage, a 5-legged movable steel undercarriage, a 4-legged wooden undercarriage and a steel sledframe undercarriage. The seating is available in all current fabrics and leathers. A synthesis of timeless design and comfort, that is what we aspire to at Palau.